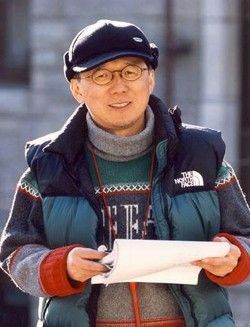 Yoon Seok-ho has always demonstrated his supremacy in making melodramas using symbolism, parallelism, repetition and timing as provocative ways to stir emotions and draw tears from the audience, especially in Autumn in My Heart and Winter Sonata. Although both dramas were basically love stories, the series tackled many contemporary themes such as character identity, loss of love as well as issues with first loves, parental love and puppy love. I am sure most people have experienced at least one or more of these different problems and shades of love. Recently Yoon Seok-ho did a presentation on Drama & Korean Style at SOAS University, London. Where he talked intensely about Korean Wave and discussed a spectrum of deep emotions and cultural proximity. He also talked about the immense success of Korean dramas abroad and its impact on the audience. It was a great honour to interview such an inspirational filmmaker. We caught up with Yoon Seok-ho at SOAS University a few days ago, where we talked about his work, the film industry and what he likes to do in his spare time. With the help of my lovely friend, Deborah Hin, who kindly agreed to interpret the interview for View of the Arts, we all sat comfortably and started the discussion by asking director Yoon about the popularity of his two dramas Autumn in My Heart and Winter Sonata. You have created one of the most popular TV dramas of the 21st century, which were, and still are, immensely popular throughout Asia as well as Europe. What do you think made Autumn in my Heart and Winter Sonata so well-known around the world? Yoon Seok- ho: Well, there are two ways when it comes to filmmaking, either a script writer comes up with an initial idea or a producer. In the case of Autumn in My Heart, I got an idea from watching a documentary, which was based on a real situation; a mother’s heartbreak. I linked my idea and the documentary story and thought, what if I made a film about a couple’s heartbreak? What would have happened with this kind of an idea? I gave my proposal to the script writer, Oh Soo-yeon, and obviously she came up with all the details based on the idea I had. With a great smile on our faces we ended the interview with director Yoon Seok-ho. We wish him great success with his new projects and we do hope to catch up with him again in the near future, perhaps in South Korea. Previous Post Heroes Reborn: Will it work?